5 myths of WW1 :: Great War Dundee - This is the story of the 30,490 men that left Dundee to fight in the First World War and of the people left at home. Myths often stem from an element of truth but as the following 5 myths demonstrate, the truth is often more surprising. Although machine-guns played a pivotal role in both offensive and predominantly defensive tactics, and they undoubtedly took their toll on troops, for example at the Battle of Loos, it was artillery that that caused the most casualties. It has been estimated that two-thirds of all casualties were caused by artillery. Men of the 6th (Perthshire) Battalion in a trench near La Boiselle in August 1915. Machine guns were potent weapons but it is believed artillery was responsible for more casualties. 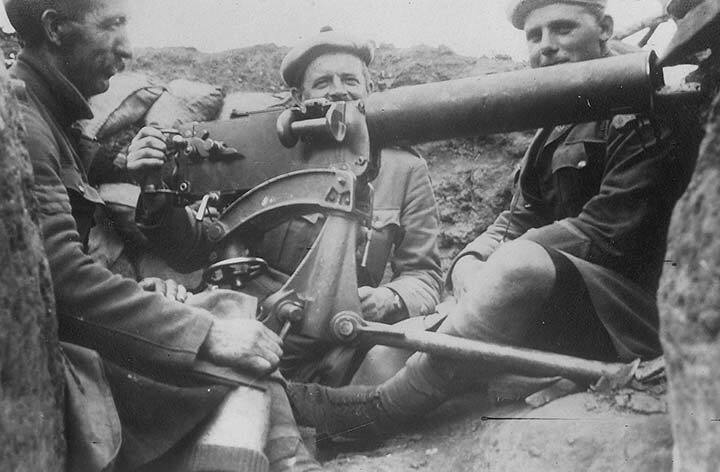 Although Gallipolii was the first campaign to really impact upon Australian and New Zealand national consciousness, it was primarily a British campaign and as such a number of Dundonians found their first experience of the war fighting the German-allied Turks in the Gallipoli campaign. 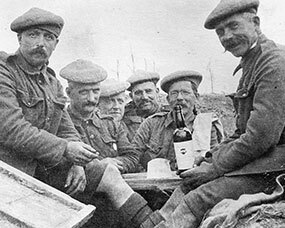 Men of the 6th (Perthshire) Battalion enjoying a bottle of wine. Small pleasures made life more enjoyable for those in the trenches. Surprisingly some soldiers found that they enjoyed the rigours of combat and military life. Others enjoyed the camaraderie and the regular meals, rum rations and cigarettes. As hard as it is to believe, some probably felt better off than they did back home, so long as they were fortunate enough to avoid going into battle. According to Dan Snow the myth that most soldiers died should be debunked. Snow cites that in the UK around six million men were mobilised, and of those just over 700,000 were killed. That’s around 11.5%. However this ignores the local effect that the military structure and specific events had on the community. Consider the local 4th Black Watch battalion, also known as ‘Dundee’s own’, which suffered huge losses at the Battle of Loos, with 57% of men being killed or seriously wounded on the first day of battle! The First World War is synonymous with trench warfare. However troops were regularly rotated in-and-out of the very frontline trenches (also known as the fire-line trenches that faced the enemy). Different nations had different policies when it came to these rotations. British soldiers spent about 10 days a month in the trench system, and of those, rarely more than three days at the front line.